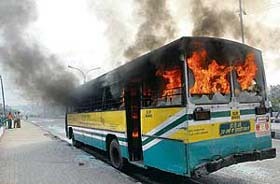 BURNING RAGE: A DTC bus is set on fire by protesting traders near Mother Dairy in East Delhi during the last day of the Delhi bandh on Wednesday. Is the Rs 100 hike in the MSP for wheat enough for the farmer? Two medical students including an Ambala-based doctor’s son were kidnapped in Bangalore. While one of the medical students had been let off yesterday morning, the doctor’s son is yet to be released by the kidnappers. Pakistan’s Foreign Minister Khurshid Mehmood Kasuri will not be coming here for attending a crucial conference on Afghanistan that New Delhi is hosting on November 18-19. In what could be a breakthrough in the sale of tickets on the black market for the semifinal encounter between Australia and New Zealand, the SAS Nagar police today arrested a member of the Punjab Cricket Club while selling tickets. B.S. 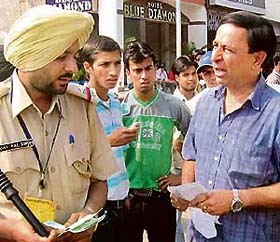 Gill (right), a member of the Punjab Cricket Club, the in-house club of the PCA, who was arrested from the Phase IX market, Mohali, for selling tickets on the black market on Wednesday.